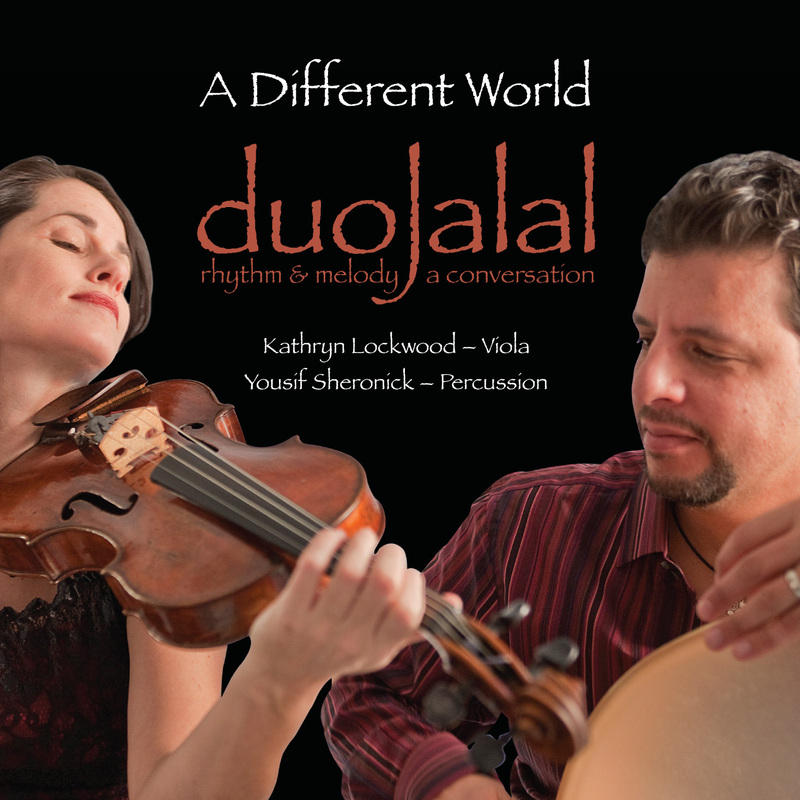 A Different World, much like the marriage between Kathryn Lockwood and Yousif Sheronick, represents an organic amalgam of cultural traditions and musical styles. The collaboration of a classical violist and world percussionist captures disparate worlds merging. The musical styles on this ground breaking disc range from Classical to Klezmer, Middle Eastern to Jazz. The confluence is natural and unforced. A classically trained violist from Australia, Kathryn ignites the instrument with her passion - one minute embodying a gypsy violinist, the next a Middle Eastern reed flutist. Yousif, of Lebanese descent, manipulates sound by simply snapping his fingers at the edge of an Egyptian frame drum or dragging his foot across the Peruvian cajon. It's evident that both members of the ensemble truly feel the essence of these genres. Kathryn studied Arab music, was coached by David Krakauer on the Klezmer style and by Derek Bermel on the music from Thrace. Yousif studied classical percussion throughout college and went on study and specialize in music from the Middle East, India, West Africa and Brazil. The compositions on A Different World evolved from various aspects of the musicians' lives, through casual conversations over dinner and coincidental reunions in unexpected places. duoJalal met Brooklyn composer Kenji Bunch at a dinner party in Manhattan, Yousif ran into Philip Glass at a music festival in Telluride CO, Kathryn met John Patitucci at a chamber music concert in the neighboring town of Bronxville NY. With the exception of the Italian Mr. Rao Camemi (who Yousif met in NYC), all the composers are New York based and friends and colleagues of the duo. The result is a stunning testament to the vibrant multicultural fabric of the city of New York and to the artistry of duoJalal. The percussion batterie includes Durbakeh, Djembe, Tar, Bendir, Cajon, Bodhran, Brooms, Wind Gong, Thai Gong, Tibetan Cymbals, Indian Bells, Finger Cymbals, Metal Shaker, Triangle, Caxixi, Goat Hoof Shaker, Bird Whistle, Maraca and Ocean Drum.